Sunset of the 15th August 1917 was red and stormy; and in its glow the 4th Worcestershire fell in at Bedford Farm and marched forward towards the front line. After darkness fell the march was very difficult. Beyond Elverdinghe the whole Battalion had to march in one long single file through heavy mud past the British heavy guns, which were firing continuously into the darkness. The Battalion filed across the causeways over the canal, and entered the wilderness of the battle-area; the Pilckem Ridge conquered by the Guards Division on July 31st. So intense had been the fire of the British artillery that hardly one flat yard of ground remained. The shell-holes everywhere met or intersected each other, and all the shell-holes were full of slimy rainwater. Across that desolate morass the long file of laden men stumbled in the dark, guided only by a duck-board track laid during the previous days and already broken in many places by the enemy's shells. To leave the duckboard track was to be lost in the dark amid that wilderness of muddy pits. Several times halts had to be called to rescue men who had slipped and fallen. Colonel Linton personally led the Battalion followed by his headquarters staff. As the long file of men. reached the crest of the Pilckem Ridge they met a heavy fire from the enemy's guns. Through the darkness the great shells came crashing down, and their blaze dazzled the struggling troops. Several shells struck close to the duck-board track, causing casualties which further delayed the march. Several of the Battalion hit during this approach march were lost to sight in the darkness and were later reported missing. Notably one subaltern, an excellent officer. Terribly wounded by a shell, he must have crawled dazed away from the duck-board track. Several days afterwards the trail he left was followed and he was found dead in a shell-hole. At length the head of the Battalion reached Signal Farm. Colonel Linton waited to see the companies pass to their positions of deployment. Three platoons struggled past. Then no more came. It became clear that the platoons behind had been confused by the shell-fire and had lost their way in the darkness. Not more than an hour remained before dawn, and unless the Battalion was there in position the attack must fail. The Adjutant went back and, aided by luck and an electric torch, succeeded eventually in finding all the missing platoons, the last of which struggled into position just ten minutes before the hour fixed for the attack. Even then many men had to be left sunk in the mud up to the waist or further, helpless under the enemy's shell-fire. At 4.45 a.m., as the first light showed through grey mist, the British barrage came down upon the enemy's front line beyond the Steenbeek, and the British battalions pushed forward to the attack. At first the 4th "Worcestershire were in second line behind the Newfoundland Regiment. 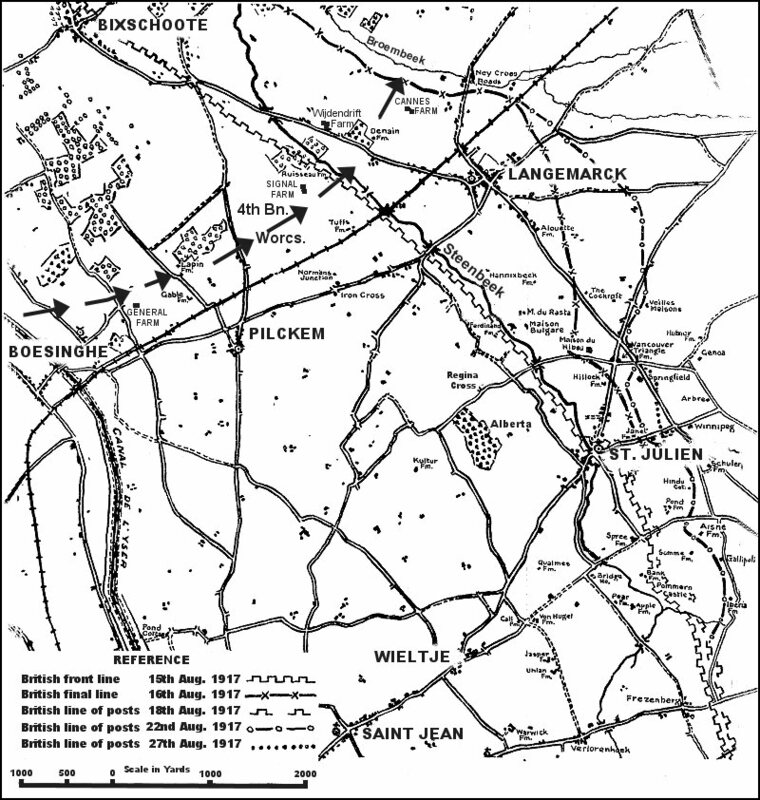 The struggling platoons crossed the stream behind the Newfoundlanders and advanced across the slightly rising ground which lies between the Steenbeek and the Broembeek, keeping direction by the embankment of the Ypres-Staden Railway, which formed the boundary between the 29th Division and the 20th Division on their right. Just beyond the banks of the Steenbeek there occurred one loss much felt by the Battalion. Captain H. J. Paddison was shot dead while leading his company. His youth and his bravery (Capt. Paddison was little more than 19 years old at his death. He had won the M.C. over a year before) had endeared him to all ranks. He was typical of the many gallant boys whose lives were the price of victory. 2/Lt. P. J. Bonfield, 2/Lt. N. M. Goodman). The attached Medical Officer, Lt. B. M. Vance, U.S. Army Medical Service, was also wounded. He was one of a number of U.S. Medical Officers attached to British units, and was one of the first U.S. officers to be wounded in the War. Other ranks, killed and wounded, 113 (detailed figures not available). Throughout the night of August 16th and until nightfall of the following day, August 17th (After dark on August 17th the 4th Worcestershire were relieved by the 1st R. Dublin Fusiliers) the 4th Worcestershire held the ground they had won, steadily digging in and improving the position under an intermittent fire. No counter-attack was attempted by the enemy across the marshy Broembeek, but all around the thunder of battle continued. Beyond the railway embankment the 20th Division had captured Langemarck, but on their right the 11th Division had found progress more difficult. Still further to the right the 48th (South Midland) Division had also made an attack. Throughout August 18th the 4th Worcestershire remained in reserve near "General Farm"; not without loss, for the enemy's artillery was active and several heavy shells struck the reserve position. That evening the Battalion was ordered back to rest, and marched back from General Farm across the Yser canal into Boesinghe Chateau; but this rest was short. Orders came next day for the 88th Brigade to take over the front line of the Division. The 4th Worcestershire moved forward that night (August 19th/20th) into a support position (Battalion H.Q. at Wijdendrift) on the extreme left of the British line, beside the French. During the next few days work was carried on to improve the position, and outposts were pushed forward across the Broembeek; but nothing of importance occurred, nor did the enemy's shell-fire cause heavy casualties. On the night of August 23rd/24th the 4th Worcestershire were relieved by the 2nd South Wales Borderers and marched back, first to camp near Elverdinghe and then next day to camp in the woods near De Wippe Cabaret. The 29th Division was moving back for rest and.training. On August 26th the 4th Worcestershire moved to "Piccadilly Camp" some two miles north-east of Proven. Casualties, 4th Worcestershire. August 19th—24th. 1 officer mortally wounded (2/Lt. S. Cale). On August 28th Captain C. F. G. Crawford was severely wounded by an accidental explosion in camp. For constant good work during the preceding operations Lieut. & Qmr. S. Parker was afterwards awarded the M.C.